Movies give us an insight into the different types of lives people lead, the obstacles they go through, the landscapes they gaze at, the hands they shake or cheeks they kiss. As we all know, societies tend to be divided into leveled sections of citizens, a phenomenon that started way back in time and that keeps shaping people’s lives on and on. Almost every city has a richer neighbourhood and a poorer neighbourhood and we often call these outcasted areas where the lives of people are harder, tougher and usually involved with drugs, violence and crime, “the hood”. Some suffer an unfortunate fate, others manage to move on and lead a better life while others even find fame and make history. There’s a lot more to that when examining the life on the streets or in the hood and that’s what these movies are here to do. 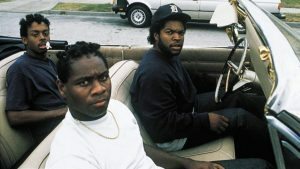 Having that said, let me start the countdown and introduce the list of top hood and ghetto movies ever. 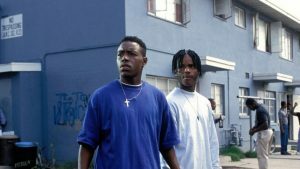 You can watch some of these best hood movies on Netflix, Hulu, or Amazon Prime. Rapper Ice Cube and comedian Chris Tucker lead the way into this comedic and straightforward film that takes a light and humorous approach on the ghetto life and the conflict one can face. Most commonly known as the top “stoner film”, it contains a handful of hilarious characters and even gives space for some good advice and some moral lessons to take in mind. Craig Jones has recently become unemployed and his friend Smokey insouciantly works as a drug dealer, selling weed from the“big boss”. Having nothing better to do with their time, they spend the day sitting on the front porch commenting on the neighbourhood’s passersby. 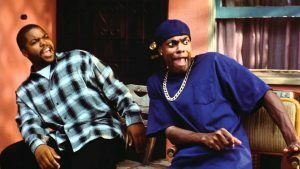 However Smokey has been smoking the products he’s supposed to sell and after confronted by his boss and entangling Craig into the situation, only one chance is given to them in order to save themselves from this mess : find 200 dollars by 10pm that same night to pay back the smoked merchandise. 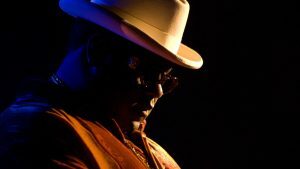 Alongside Tupac and others, once cannot disagree with the fact that “The Notorious B.I.G” or also called “Biggie Smalls”, was and still remains one of the biggest and widely known artists from the rap industry. Just like many other black American men who rose to prominence in the music sector, he also grew up in a drug-involved neighbourhood (Brooklyn), which he quickly became associated to when starting to deal drugs at an early age. The film relates the life and death of this iconic figure, highlighting the struggles and violence that stuck to the character, even when achieving fame and success. This naturally includes the East Cost-West Coast rivalry and the conflictual relationship with Tupac, not to mention the various romantic relationships with women he carelessly started and ended. A great depiction of this rap genius as a person living in a world where much is still to be changed. 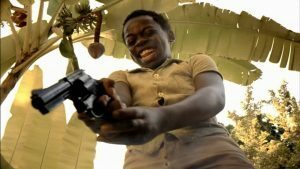 From the same producers of “City of God”, emerged “City of Men”, another great tale of friendship, life choices and survival in a violent and drug-ruled “favela” of the Brazilian city Rio de Janeiro. Taking us right into the root of these poverty based hoods, we are faced with the chaos of aggressive rivalry that quickly builds up into a gang clash, something that unfortunately develops quite rapidly when everybody in the place owns several guns, is consumed by hate and power and isn’t afraid of death. In this atmosphere we’re introduced to two young teenager best friends named Acerola and Laranjinha, who’s fathers have been absent their entire life. As the hood war becomes risky and tumultuous, so does their friendship when they start assembling information about their fathers’ pasts. 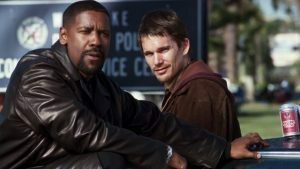 “Training Day” gives us the perspective of the functionality of the “hood” from the position of police officers, however we’ll soon realise that these often take a big part in the violence existing in the first place and are frequently not better than the “gangsters” themselves. Officer Jake Hoyt must pass an evaluation day with detective Alonzo Harris (incredibly performed by Denzel Washington) in order to be accepted in the narcotics division of the Los Angeles Police Department. Their journey will bring them into the depths of the “streets” and will take a twist for the worse when understood the immensity of Harris’ corrupt, selfish and aggressive behaviour. Perhaps a very big critique on the dishonesty and money-hunger of some individuals working for the authorities, which really shows the dimension of the problem these neighbourhoods are facing. A rather unfortunate story in which the protagonists ends up entangled into a life of crime and violence he was warned not to enter. This film is another excellent examination of the difficulty of being a black man living a life in the impoverished and dangerous neighbourhoods of America. Caine Lawson lives in Watts, a Los Angeles area, and signs up into teenage crime just like many others of his friends have, although trying at first to resist this life that predicts loud and clear an unsafe future for the one living it and the ones around. Not being just another typical film of this genre, it is one that truly backs up a message of the reality many people face and that is still nowadays very much alive. Don’t be fooled by the perhaps unserious-looking title but rather dive into it with open arms and enjoy the greatness of this production. N.W.A (Nigazz Wit Attitudes) was an iconic and highly influential hip hop group who made gangster rap popular and who’s opinions and experiences growing up in the hood materialised into controversial and explicit lyrics accusing and exposing several issues, in particular related to police violence and racism. Its rise and fall is shown and explained in this provocative biographical film, where Eazy-E, Ice Cube and Dr.Dre are portrayed by a strong and confident cast, from which the second is played by his own son O’Shea Jackson Jr., and where the music feels like the best help to bring out the atmosphere and success it was at the time of its release. A combination that works and that gives the best possible perspective onto this unstable world where even fame won’t solve the problems its battling against. 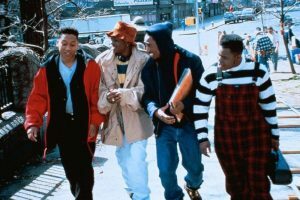 It is easier than thought, to become lost in the gradual gain of “juice”, which four teenagers from Harlem refer to as power and respect. Following them through their day-to-day lives, we notice the repetitive police and gang harassment present in their reality, which brings us into this atmosphere where they quickly, too, become corrupted by this pursuit of power. However it is particularly one of them that takes the lead and quickly goes off the rails in this gun-violence controlled hood. Once more on this list, we face a film in which we have the two possible outcomes from this degenerating life, where the character either gets sucked into a life of crime or overcomes the attracting forces and liberates itself forward into a better future. Starring Tupac Shakur, it’s definitely a crime film worth a watch. 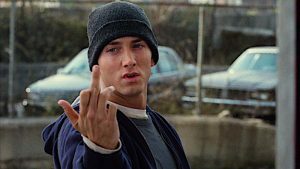 Although based on his life and on true events experienced, Eminem puts on, for this film, the shoes of Jimmy “B-Rabbit” Smith Jr., a young working-class mechanic living in a trailer home in the poor neighbourhood of Detroit. With a talent for words and rhymes but surrounded by a struggling lifestyle, Jimmy goes on the highway of trial and error which will eventually lead him to triumph in finding his own voice, in the understanding of his self and in the construction of his identity. A very powerful film, where the struggles of a white man in a predominantly black music industry ends up in one of the most iconic rap battle scenes ever shown on a big screen. Eminem is excellent and the essence of the whole film. 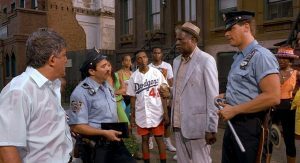 Critically acclaimed and highly successful at the box office, “Do The Right Thing” handles with themes such as racial division, racism and police violence, setting the topics around a Brooklyn neighbourhood on an extremely hot summer day. It follows the quick shift from peace to violence and how this one grows and grows solely due to racial tension coming from two different sides. As the title conveys, one must do the right thing for both parties in order to stop violence from occurring and it is therefore through this comedy-drama filled with incredible characters that a message is transmitted, one that is truly worth seeing and for which many awards and nominations were rightfully given. A simple story, set over the course of 24 hours, black and white and with a small budget. This simple story however, carries a heavy message and boldly addresses the racial and class discrepancy found in our present society. 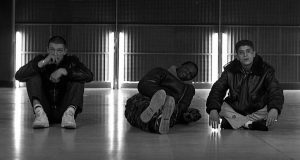 Inspired by real events that took place, this film revolves around three inhabitants of the Parisian suburbs, a Jewish, an African and an Arab, who learn of the death of a friend who was involved in a riot and who’s injuries caused by police brutality are the cause of his fatal end. This enrages them and brings desire for revenge leaving hate as their only motivation for the hours to come, just like one of them states “ hatred breeds hatred “. And for the weeks following the film, it was the awards who were waiting on them, in order to pay tribute to the meaningful efforts and grandiose performances offered to the world. 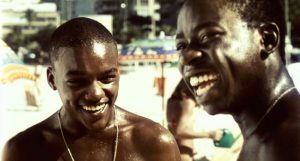 “City of God” is a real and existing neighbourhood of Rio de Janeiro, where the movie is set, shot and taken some non-professionals actors from (as almost the whole amateur cast came from “favelas” around the area). 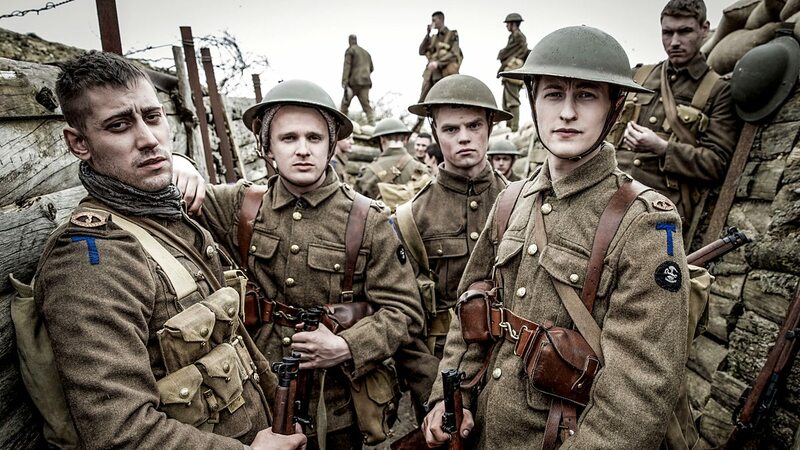 It is in every aspect an amazingly well-produced film, with a furiously stylised presence and a powerful authenticity to the story and the reality behind it. It follows the growing of organised crime in this Brazilian violent neighbourhood through a variety of characters, each with a specific nickname related to their attributes. We can see the development of a whole gang generation and the unstoppable influence on children, who will subsequently take on the role of the deceased member in a never-ending process. Truly poignant and heartbreaking at times, it can be said to be the most raw and revealing observation on the hood of South America’s biggest country. “Boyz N The Hood” is a remarkable piece of work, one that examines the struggles of poverty, crime and violence found in the ghettos of the Los Angeles neighbourhoods. Through the lives of three different characters amongst others, we understand the difficulty and the vicious cycle that traps the black community established in these suburbs in an ongoing and endless violence and blood-shedding conflict. It is hard for the people that grow up in a surrounding of this sort to detach themselves from the influence and from the sometimes inevitable involvement, however with the right guidance and self-determination, a healthier and more peaceful life always lays ahead of oneself. These paths, these choices and these opposites are observed through the lens of this film, giving us an insight into these struggling characters and the road they decide to follow.